2017 has been the 75th birthday of the first of the Famous Five books and children are still avidly gobbling up the 21 adventures. To celebrate the anniversary of ‘Five on a Treasure Island’, Hodder Children’s Books has given the complete set a shiny new wardrobe of covers, and fans will be pleased to know that after a brief foray into modernising the vocabulary in 2010, the Famous Five are once again enthusiastically discussing pullovers, awful swotters and Mother and Father and exclaiming, “Mercy me!” If you’re a Blyton bookworm, young or old, Dorset is the perfect place to recreate a little nostalgic adventure. As Julian says in ‘Five Go Off in a Caravan’, “I do love the beginning of the summer hols. They always seem to stretch out ahead for ages and ages.” “They go so nice and slowly at first,” replies Anne, “Then they start to gallop.” Why not book a Dorset cottage and enjoy an intriguing break of your own, exploring (with abundant picnics of potted meat sandwiches and fruit cake) these spiffing sites which inspired the books? 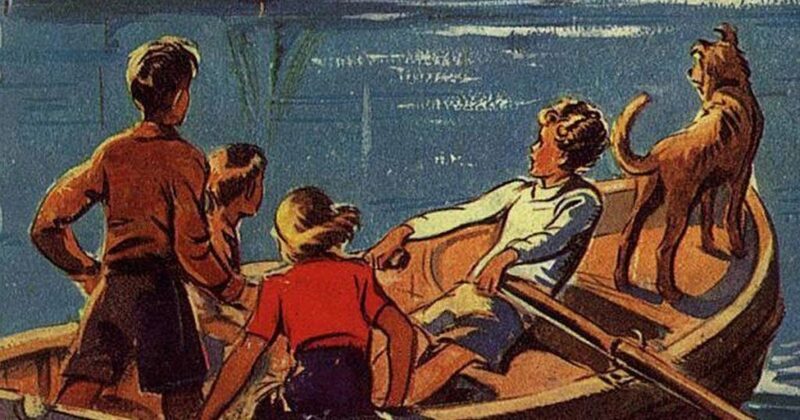 The Famous Five solve mysteries in idyllic surroundings which come alive in the timeless villages, dusty lanes, lush countryside, picture-perfect farms and unspoiled coast of the Isle of Purbeck (really a peninsula). Blyton, who visited Dorset three times a year for over 20 years, loved this landscape where her characters ‘watch waves break into spray over rocks’, ‘lie on heathery beds listening to sounds of the night’ and ‘smell the drifting scent of honeysuckle’. Golden cottages in sleepy villages still have smugglers’ secret passages, and hidden coves, which may well be Smuggler’s Top and Demon’s Rocks, have eerie caves and caverns where the Five shone their torches (which they always carried, together with maps and sandwiches) and discovered clues, like cigarette ends, to contraband stashes. This dramatic hilltop ruin was the inspiration for Kirrin Castle where gold was hidden in ‘Five on a Treasure Island’. The real castle formed an impenetrable barrier between south Purbeck and the rest of England. Originally made of wood, it was rebuilt in the 11th century by William the Conqueror and continued to be used for 600 years by monarchs and their constables, until it was sold by Elizabeth I to her dancing master. Eventually besieged and destroyed by Parliamentary forces in the Civil War, it’s now a deceptively peaceful site managed by the National Trust. 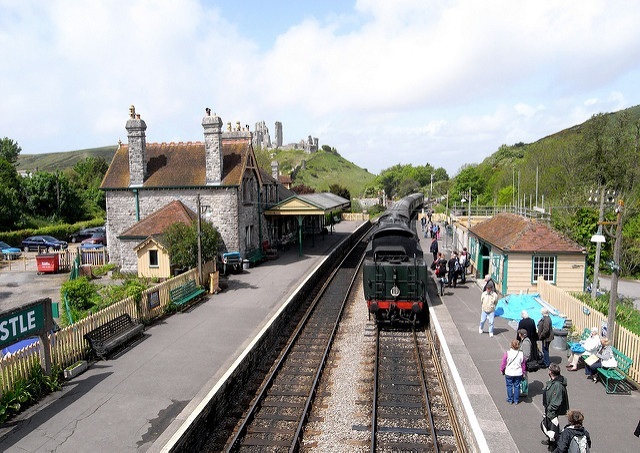 Enid Blyton arrived by steam train in 1941 to visit Corfe Castle on its majestic hill with the wonderful views. You can still retrace her atmospheric journey on the Swanage Railway which chugs between Swanage and Norden. Corfe Castle Station was built in 1885 and looks just as picturesque as it would have when the Famous Five alighted amongst the leather trunks, porters and Ladies’ Waiting Room with its coal fire. Even if you don’t board the train, the station is worth exploring, with fascinating archive films to watch in the cinema coach and its Station Master’s lounge restored to the 1950s. ‘When Anne awoke she couldn’t at first think where she was. She lay in her little bed and looked up at the slanting ceiling, and at the red roses that nodded at the open window – and suddenly remembered all in a rush where she was! “I’m at Kirrin Bay – and it’s the holidays!” she said to herself, and screwed up her legs with joy.’ Lulworth Cove’s curve of white pebble beach and azure water is likely to be the Famous Five’s Kirrin Bay, the ‘little cove not far off where they could bathe and paddle to their hearts’ content’. It’s certainly a lovely place to visit, with lots of rock pools to explore and boat trips to the iconic arch of Durdle Door. This lowland heath between Corfe and Stoborough, which is manged by the National Trust, stars in the 1954 ‘Five Go to Mystery Moor’ and is a stunning nature reserve to visit for its seclusion and peace, as well as lovely views and rare plants. It’s not nearly as sinister as it sounds when the Five camped out, and if mist descends you’re more likely to bump into Ruby Red cattle than the menacingr ne’er-do-wells who captured George and Anne. This is Thomas Hardy country too, masquerading as Egdon Heath in ‘The Return of the Native’. Catch the ferry safely from Poole to ‘Whispering Island’, where the Five were washed ashore in a rowing boat called Adventure in ‘Five Have a Mystery to Solve’ and discovered an iron door down an old well – leading eventually to a room full of treasure, of course. 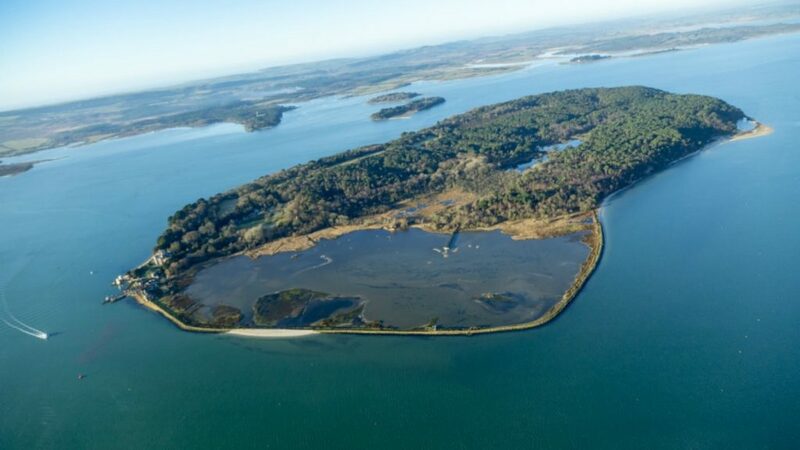 It’s no wonder Blyton called it ‘Keepaway Island’ and associated it with mystery, since the island was owned from 1927 to 1962 by reclusive Mary Bonham-Christie, the ‘Demon of Brownsea’, who evicted the residents and banned visitors. Nature reclaimed Brownsea Island and the ‘treasure’ you’ll find on the National Trust-managed isle now is more likely to be red squirrels and other abundant wildlife which have made the woodland, heath and lagoon their home. It’s a fine place for a picnic, though, with lots of outdoor family-friendly adventures and history to explore. This is the ‘enormous blue lake that glittered in the August sunshine’ in ‘Five Go Off in a Caravan’ and also featured in ‘Five Go to Mystery Moor’. 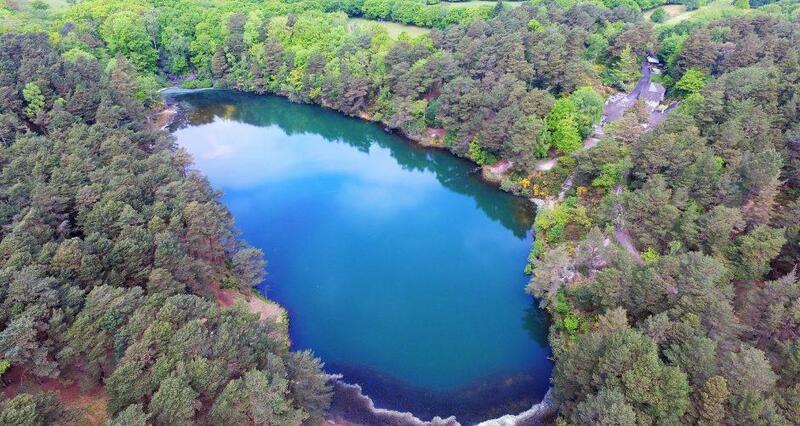 Once a clay pit, it’s been reclaimed by nature and you can walk around the lake, which has stunning colours varying from green to turquoise (or ‘a wonderful dark blue’) due to the fine clay which diffracts light in the water. Sandy paths lead you up steps to views of the Purbeck Hills or down to the water’s edge. The seasonal Tea House serves yummy cream teas. 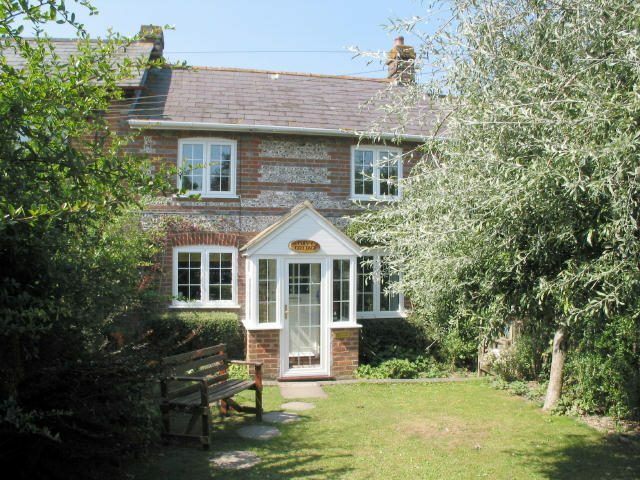 We’ve all sorts of Dorset cottages waiting to welcome you to Famous Five country. Many of them, like pretty Poppy Cottage, would be right at home in the pages of Enid Blyton’s books; please ask us (01647 433593) for more recommendations – we’ll be pleased to help you plan your adventure. We hope to meet you cycling or walking the hedgerow lanes with a greaseproof-paper-wrapped parcel of sandwiches and a bottle of pop very soon!